The Explorer interface provides users with the ability to obtain a list of ReportCaster items, by type, displayed with detail column information specific to the item type selected. The list can be filtered by Schedules, Distribution Lists, Access Lists and Library Reports, or Watch Lists in the selected folder. It can also include items in subfolders of the selected folder. The View Library Report from the link in the Library notification email will also access the Explorer filtering by the Library Output item type. Access to the Explorer is controlled by the Client security authorization model. Users can be authorized to access the Explorer at the Repository folder or at specified lower-level folders. For information on the operations that control access to the ReportCaster tools, see the WebFOCUS Security and Administration manual. Authorized users can access the Explorer option from the context menu of a folder. The Explorer option is also available from the Tools menu, located on the BI Portal and Dashboard Menu Bar, provided that the user is authorized to access the Explorer from the Content folder. When the Explorer interface is selected from the Tools menu, the Content folder is the default folder location and is expanded to list the folders that the user is authorized to access. The following image shows the Explorer with the Content folder as the selected folder location. When the Explorer is selected from the context menu of a folder, the selected folder location is passed to Explorer so that the folder is the selected folder in the Explorer tree and schedules the user is permitted to access are listed in the right panel. The following image shows the Explorer invoked from the Coffee Product Line folder in which there are three schedules the user is authorized to access. Note: Once the ReportCaster Explorer is launched from the BI Portal, logging out of or closing the BI Portal does not close the ReportCaster Explorer. 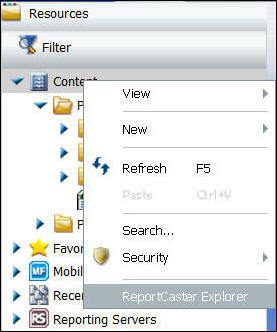 You must manually close the ReportCaster Explorer when you log out of or close the BI Portal. If you log back into the BI Portal with a different user name while the ReportCaster Explorer is open from a previous session, the ReportCaster content from the previous session will be visible and available in the ReportCaster Explorer.